This strategy is meant to address the costs associated with collection of unnecessary data and implementing avoidable protocol amendments. Eliminating these inefficiencies has the potential to reduce the magnitude of several cost parameters represented in our model. As described in Section 4.6.2 above, drug sponsors estimate that approximately 15 to 30 percent of all clinical data collected is never used in New Drug Application (NDA) submissions, according to a 2010 article by Kenneth Getz of Tufts CSDD (Getz K. A., 2010b). Therefore, to model the data collection savings that would result from streamlining trial protocols, we reduced data collection, management and analysis costs (per study) by 22.5 percent in all phases (the midpoint of 15 and 30 percent). If protocols are simplified, fewer clinical procedures will need to be performed yielding an additional source of savings. According to a recent study conducted by Tufts CSDD, 22.3 percent of all procedures are considered to be non-core and can be considered “extraneous” (Tufts CSDD, 2012). Based on this information, we also reduced the clinical procedure total (per patient) by 22.3 percent in all phases. 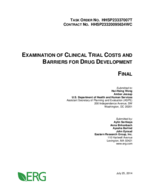 To quantify the cost savings associated with eliminating avoidable protocol amendments, we referred to the recent Getz/Tufts study discussed above, which found that 33 percent of amendments were “avoidable” or “somewhat avoidable” (Getz, et al., 2011). In our interviews, we heard from one industry representative that his company categorizes its protocol amendments either as avoidable or unavoidable (“unavoidable” being instances of unforeseen requirements or new data surfacing; “avoidable” being problems of oversight, for example, that could be minimized through better planning) and found that the breakdown was roughly even across the two categories. To be conservative, we reduced the number of IRB amendments by 33 percent in our model (as explained in Section 2 above, the average numbers of IRB amendments by phase and therapeutic area were derived from this same Tufts study). In addition to the effects listed above, this approach would also likely impact the number of SDV fields (as the amount of data being collected would be reduced) and registered nurse (RN)/clinical research associate (CRA) and physician costs per patient (as the number of procedures performed would be reduced). Furthermore, simplified trial protocols might make trial participation less burdensome and exhausting to patients, thereby making it easier and perhaps cheaper to recruit and retain patients. However, we did not have enough information to include these additional effects in our modeling. Table 6 presents the expected cost savings from implementation of simplified clinical trial protocols and reduced amendments. These range from $0.0 million (hematology) to $0.6 million (ophthalmology) in Phase 1, $0.3 million (hematology, anti-infective, cardiovascular, and dermatology) to $1.1 million (ophthalmology) in Phase 2, and from $0.2 million (hematology) to $2.4 million (ophthalmology) in Phase 3. At the upper end, the savings amount to 8 to 12 percent of study costs in ophthalmology across Phase 1 through Phase 3. In Phase 4, savings could range from $0.2 million (genitourinary system) to $4.2 million (respiratory system).